This week I have been talking about this event I am hosting on Thursday, January 24th at 8:00pm called Winter Webinar. I have been committed to doing something like this all winter long. The purpose of Winter Webinar is to discuss those hard things we are dealing with that become harder, more intense during the winter season. Over the years, I’ve experienced and watched others, especially in January, February, and March, feel keenly alone and isolated. We struggle more with our emotions because of the barrenness of winter, the hardness, harshness of winter. That may have a lot to do with the sun shine or how much we don't see the sun because we are not outside in it. I know a lot of people who like the winter season. My daughter and son-in-law spend hours out in the snow playing because it's fun for them. But it's not fun for me. Snow is beautiful looking at it from inside my warm house. But if I have to go out in it - yeah, I'm not a fan. I struggle not only with the extremely cold temperatures - it is true in the heat of summer too. Stress is stress. Hot temps are stressful, cold temps are stressful especially when they are in the extremes. I know, I’m a pretty picky temperature person. My internal thermometer needs it to be pretty nice all the time. My husband teases that is between 68 and 72 and that's that's pretty much true. So when conditions are extreme, I have to work harder to cope. That is why I want to do an event that would address the loneliness, the isolation that we often feel in the middle of winter. I has been my heart's desire to give women a safe space to talk through and process the emotions that come up for us. I know that a little bit of sadness or discouragement can dive quickly into despair and depression. Those emotions become prevalent during the winter months. But I also prefer not to have to ‘get out’ in the weather. So I wanted to facilitate conversations with others we can connect with from the comfort of our own homes. We may still be alone, but we don’t have to feel alone as we recognize we are not the only one experiencing this struggle during this time of year. Then yesterday I was home by myself and it was especially cold. Like I said earlier, I don't do well with the extremes. I couldn't find a warm place in my house. I mean I was practically sitting on top of our wood stove at times. So I would stoke up the fire again then it would get too hot so I had to scoot away. I found myself exhausted at the end of the day from the struggle of trying to get warm, to be comfortable. I woke up with a clear agenda of what the day was going to be; an afternoon with a dear friend and the evening with some #SoNowSisters from my networking group. But as the day wore on, the stress of dealing with the cold took energy I needed to do those things. First I rescheduled with my girlfriend. A few hours later, I called off going to the networking event. Should I have forced myself to get into the space of others? Maybe, but I didn’t have the energy to get dressed, go out in the weather, and still have any juice in me to have a productive conversation. I noticed that my thoughts were compromised as well. It wasn't one of those days when I was “down” like I sometimes am, but I was going down fast. The thought occurred to me. I am hosting a webinar (Thursday night 8:00pm)t about how to deal with days just like this. Days that are hard and everything seems harder and you are gritting your teeth just to get through it. Who am I to try to help people who are having those days when I have those days? Ever felt that way? You are trying to help people who are dealing with a problem you have. The ironic thing was just a week ago, I said that same thing about my book. I’m writing a book with the working title of ENVISION YOU: UNSTUCK AND CONFIDENT. One of the coaches from the publishing school that I'm working with posted a video. She commented that she hears this from a lot of would be authors. “I want to write this book about ______________ but it is the very thing I'm struggling with. Who am I to write this book? You are the exact right person to write it. You know what it feels like. You know the roadblocks and tunnels. You have experienced what it takes to get through them. You are the one who needs to write about it because you know it. So I sat back, huddled up in my blankets around my wood stove, and I pondered that thought. Change the way you think, Kathy. This grit-your-chattering-teeth-day is a learning time. It's not meant to take you down. It's meant for you to remember what it feels like to feel alone, to feel isolated, to feel unsafe in some way ( for me it was just from the cold). I am hosting the WINTER WEBINAR because I know what it feels like to feel all of those things. But I also don’t want to become consumed by those feelings. So while we will take some time to acknowledge the HARD STUFF we are dealing with this winter, our focus will be sharing ways we notice HOPE in the middle of it all. I had some good practice yesterday. There is no charge for this event, but you must register to get the login information. Sign up right now to be sure you are set up before we meet. Here’s to proactively taking on the winter months and making the most of them. P.S. 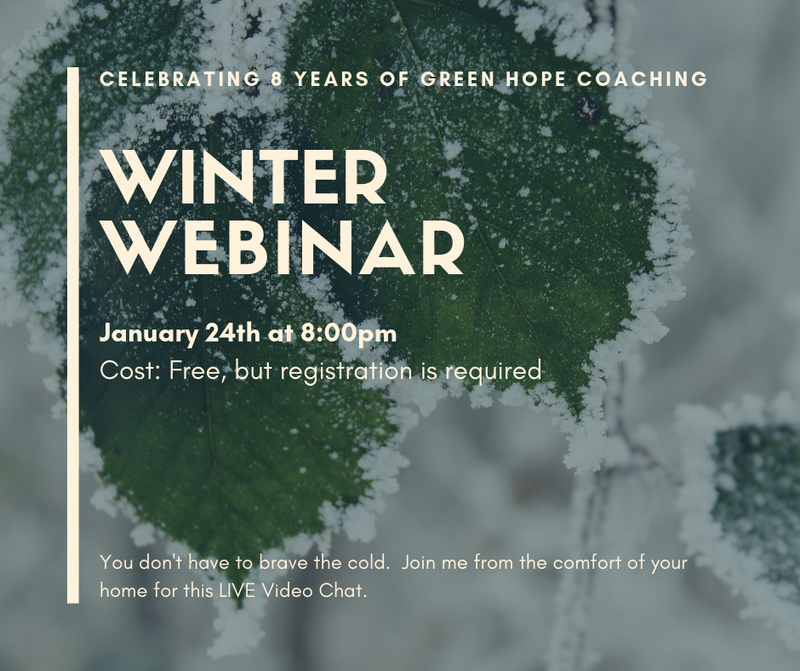 The WINTER WEBINAR is the first in an ongoing series for 2019 called GREEN HOPE GATHERINGS I plan to do each month of 2019 discussing various topics. Be sure to sign up so you don’t miss any of them. Or email kathy@kathyburrus.com with GREEN HOPE GATHERINGS in the subject line. I’ll add you to the email list to be sure you are notified about upcoming events- LIVE or virtual. Older PostMy Gift to you, GHC world!